Once again, our community has been devastated by senseless gun violence that continues to plague cities and communities across our country. As a community, we mourn and our hearts are broken for the families of those who lost their lives. While we may never know the motive for the tragedy that took place in Antioch early Sunday morning, we do know that an assault-style rifle was used once again. There is no place in our community for these types of weapons. While the suspect was reportedly allowed to possess his firearms by his own father, he could have purchased the assault-style rifle out of a trunk in any parking lot in this city without any background check. Furthermore, he could have been pulled over on the way to the Waffle House and law enforcement could have done nothing more than possibly cite him for indecent exposure. This is unacceptable, and we, as legislators, must do more. Thank you to the MNPD and all other public safety officers for their tireless, diligent efforts to respond and capture the suspect. I have great news for those of you who hold your breath every time the state legislature convenes. The 110th legislative session is expected to adjourn sine die this week. 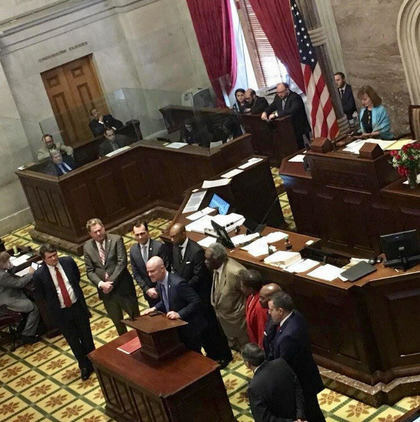 Budget: Last week, we passed the state budget after a bit of controversy surrounding Republicans’ admitted efforts to punish Memphis for its legal removal of the Forrest statue. I voted “No” on the state budget for several reasons: it once again failed to include Medicaid expansion; failed to adequately fund for our public schools; lack of a substantive investment in the opioid crisis plaguing our state; and insufficient investments in our state’s infrastructure. Testing Snafus: Yet again, our teachers and students fell victim to a flawed computerized testing system last week. Fortunately, we were able to successfully hold up final passage of the budget until we passed bipartisan legislation that seeks to protect schools, teachers and students. Throughout the week, I did my best to share real-time updates from the Tennessee Department of Education with everyone on our Facebook page and remained in constant contact with school officials in District 55 who reached out to me via phone and email. In response to the testing issues, my colleagues and I called on Commissioner McQueen to resign for the repeated failures of her department. To this day, McQueen has failed to apologize for her role in the latest snafus or take any personal responsibility for the issues with which our administrators, teachers, and students have repeatedly had to deal. I fully support the TBI investigation into the alleged hacking of Questar and encourage our state to revoke the $30 million contract and seek liquidated damages from the contractor. FOCUS Act: Recently, our legislature also passed the FOCUS Act. I strongly opposed this legislation for many reasons. Among other things, this legislation introduced by Governor Haslam allowed him to vacate the entire 27-member UT Board of Trustees and personally handpick the entire new 11 member board. For a more in-depth explanation of why I opposed this bill, check out my Facebook video here. Because of my strong opposition to this legislation, I refused to vote in favor of any of Haslam’s appointees to the newly configured board. Still Working: While most committees have closed, we re-opened two of my committees on Monday morning to take up some last minute bills and joint resolutions. I was scheduled to present SJR554 and SJR557 before the House health subcommittee at 11:00am, but Republicans moved to adjourn the subcommittee before the resolutions were debated. Their underhanded tactics were in direct response to my vocal opposition to a few of their latest bills they have brought to the House floor, including erecting a monument to unborn children on the Capitol grounds. Both resolutions were introduced and previously passed in the state Senate by Sen. Yarbro, and they were in line with a directive from Washington that encouraged states to seek federal Section 1115 demonstration waivers for state-specific programs to combat opioid addiction and substance abuse issues. SJR554 encouraged the Bureau of TennCare to improve access to and quality of treatment for eligible Tennessee residents suffering from addiction to opiates and others substances by means of appropriate federal Section 1115 demonstration waiver for Medicaid services. SJR557 encouraged the Bureau of TennCare to seek an appropriate federal Section 1115 demonstration waiver in order to expand access to evidence-based home visitation services to the families of babies with neonatal abstinence syndrome and encourages the seeking of additional funding opportunities for the home visitation programs.